Reach In Closet Organizers Discounts Apply ! Reach In Closet Organizer System made with 100% Solid Wood . Furniture quality finish, and heavy-duty quality hardware. Shelf Depth 12". Click on the picture for detail. Walk In Closet Organizers Discounts Apply ! 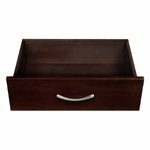 Walk In Closet Organizer System made with eco-friendly 100% real Solid Wood . Furniture quality finish, and heavy-duty quality hardware. Shelf Depth 16". Click on the picture for detail. Closet Accessories Discounts Apply ! 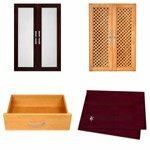 Accessories for your Reach In and Walk In Closet Organizer. Closet Doors, Drawers, Shelves, and more. Click on the picture for details. Closet Center Island Discounts Apply ! Walk-in closets Center Island that is unique and modular. The stand alone Center Island can be configured in many ways to suite your closet organization needs. It is made with 3/4" solid hardwood and furniture-quality finished. Click on picture for different configuration options.